Standing NATO Maritime Group Two. Civil-Military Cooperation for Medical care of sailors at sea and ashore was the focus of the 22nd NATO Maritime Medical Conference, hosted by the Irish Naval Service and led by Allied Maritime Command last month in Cork, Ireland. 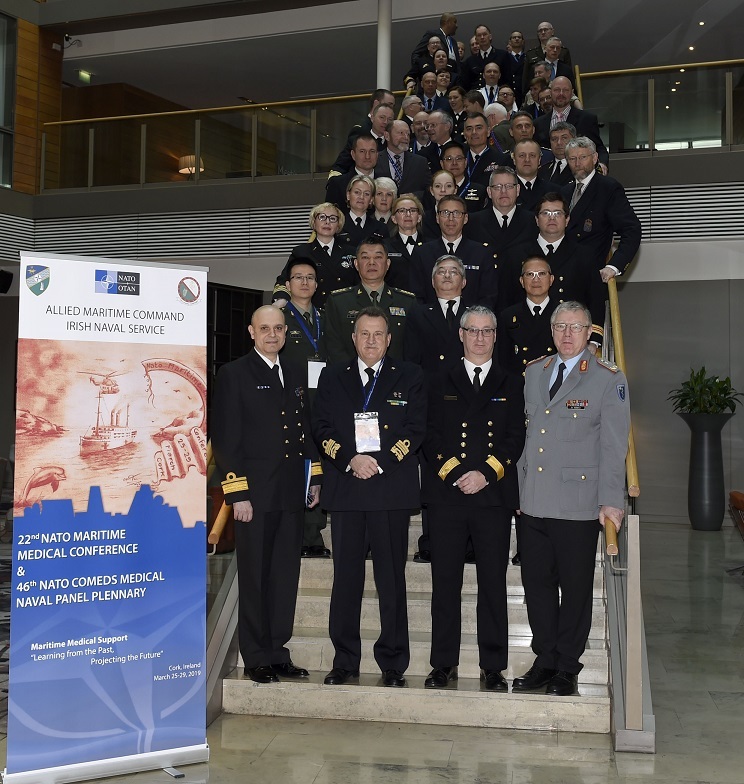 NATO say that in conjunction with the medical conference, the 46th Medical Naval Panel Plenary took place, serving as a forum to discuss naval medicine and fine tune NATO doctrine. “The conference included insightful lectures presented by many medical professionals including Colonel Gerald Kerr, Director of Irish Armed Forces Medical Branch, who depicted the past; present and future of Irish Armed Forces Medical Service, Dr.
Senior medical personnel, from 25 nations (Australia, Belgium, Canada, China, Estonia, Denmark, Finland, France, Germany, Greece, Republic of Ireland, Israel, Italy, Latvia, Lithuania, Netherlands, Norway, Portugal, Romania, Sweden, Thailand, Turkey, Ukraine, United Kingdom and the United States of America), representing NATO, Partners and other Nations, presented and discussed naval medicine topics over three days. “Improving networking and sharing knowledge and best practices in the Maritime Medical domain are key factors to increase cooperation and simultaneously insure the best treatment for our sailors at sea.” said Captain Filippo la Rosa, Medical Advisor to MARCOM and chair of the NATO Maritime Medical Conference. Cork? Ireland?!?!? A neutral that requires a referendum to send out their grey painted fishing boat to ‘protect us’. Purlease! If this doesn’t sum up the something for nothing approach of international relations, I don’t know what does! About time we started choosing our allies based on the principal of reciprocity. They’re hosting a conference, nothing else. Not sure what it has to do with ‘the something for nothing approach of international relations’. First no we wouldn’t as shown by the Med deployment and consideration in joining the Piracy patrols instead. Second Irish forces have worked with and trained with NATO forces before. One of the Sniper competitions was held in Ireland a couple of years ago for example. they only went for the Guinness! Look at Ireland’s long standing UN contributions and the number of personnel they have had killed and injured on those operations then wind your neck in. Absolutely support the UN having a conference in Ireland. But this is about NATO. The Republic of Ireland is a participant in NATO’s ‘Partner For Peace’! NATO and ” the 46th Medical Naval Panel Plenary” with careful reading, so I think this is the reason.